Brains are funny things, and the psychology of how they work is utterly fascinating to me. It is particularly interesting to me how we are able to harness the power of belief to create the circumstances of our life. The study of psychology has come a long way since Freud first speculated on the nature of a cigar. We still don’t have a predictable rule book for how the mind works, but we’ve learned about ways of thinking that do not serve us, and developed strategies for helping people find mental stability in an unpredictable world. But as far as we’ve come, the mind and its operations are still the realm of mystery and speculation. No two of us are alike, and it is our minds that make us unique. 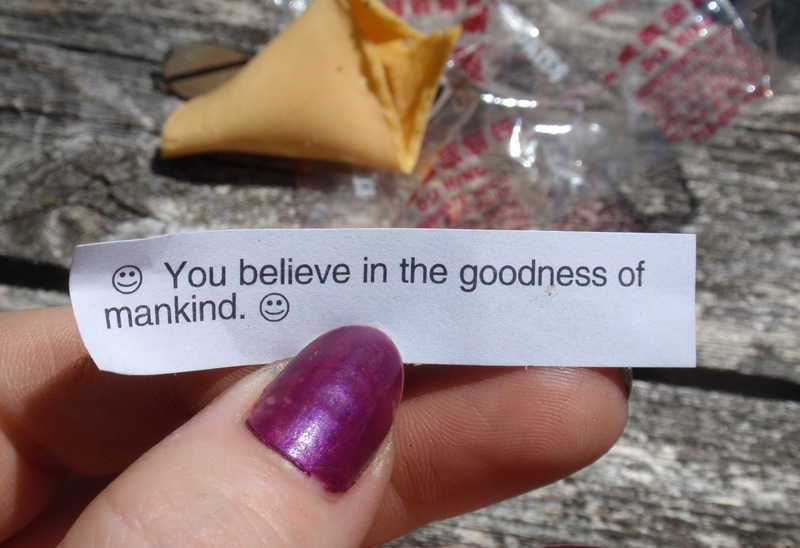 Our beliefs power the operating system of our brains. We tend to see what we expect to see, and not notice what we aren’t expecting. People who have trained themselves to be especially observant to unexpected cues seem extraordinary to us, like Sherlock Holmes. Our expectations create filters that help our brains sort and process the otherwise overwhelming flood of information that we are exposed to each day. We make certain assumptions about how the world works and what will happen next, and our experiences generally conform to these expectations. But expectations don’t just give us help in planning our days; expectations have the powerful ability to influence outcomes. Expectations, and the filters that are formed by them, have the power to shape our experiences. Expectations influence results, so it’s important to set our expectations with intention. As an example, look up “Double-Slit Experiment” and prepare to be blown away. If you haven’t already heard about this, it’s an experiment with results that confound current science. In a nutshell, the experiment proves that particles behave differently if they are being observed. The act of observation changes the outcome. Think about that a moment. The physical world – the part that can be observed and measured – changes depending on whether or not someone is watching. So when I assert that expectations influence results, I’m talking about a measurable phenomenon. There is a controversial set of experiments that I find utterly fascinating. Conducted by Masaru Emoto of Japan, he made the startling assertion that the physical properties of water change visibly depending on the source of the water and the intention of the person handling the sample. For example, clean water and polluted water display different crystalline structures when frozen and viewed under a high-powered microscope. Well, that’s believable. What begins to strain credulity is when he exposed clean water samples to words written on the containers. Positive words such as “love” created beautiful crystalline structures, whereas negative words such as “hate” created distorted ice crystals. Startling, eh? 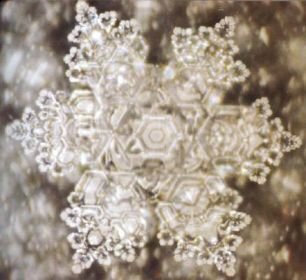 Emoto has done many experiments with water, and while his results are controversial within the scientific community, he has concluded that water molecules store information and can respond to environmental stimuli. In other words, if you speak loving thoughts to your glass of water before you drink it, the water you drink will be measurably different than if you said, “I hate water” before you gulped it down. Expectations influence results. So where am I going with all this? I have come to believe that our intentions and expectations, shaped by our words, can have the power to influence outcomes. Consequently, we should guard against persistently negative states of mind, because we will tend to create the negative circumstances we are dwelling on. But conversely, there is great value in learning how to cultivate a more positive state of mind, for it will likewise tend to create a more positive environment for us. Attitude is everything, and we have the power to choose our attitude. Part science, part psychology, part magic, I use this principle when working with essential oils. If water has the power to change and record our intentions, I believe that essential oils are likewise capable of being “programmed” with intention. Furthermore, because they are complex chemical compounds already, each essential oil already has predetermined energetic properties that can be enhanced by our intentions. For example, lavender has inherent sedative properties, but if I additionally add the word “peace” when handling the oil, then I believe I might be enhancing the properties and effects of this oil by the power of my intention. So now when I use the enhanced lavender oil, it will be more likely inspire peaceful rest. Can I prove it? Well, only anecdotally. I don’t have a lab nor the expertise to conduct an experiment that would satisfy a scientist, but I don’t need that for myself. Expectations influence results, and *that* is a truth that is already well established. If I expect an oil to help me in a specific psychological way, then it most assuredly will. Potion makers and magic users seem to have grasped this truth long ago. Each substance in nature has inherent properties that can be combined and then enhanced with words, ie, a spell. While I don’t generally consider my essential oil blends to be potions, I have no problem with them being thought of as such. You don’t need to believe in magic to believe in the psychological benefits of positive thinking. If you expect an oil blend to have a particular psychological result (peace, confidence, clarity), then you are far more likely to get what you expect. From what I can see, magic is all about harnessing the power of intention and expectation. This is the principle that underlies most of the work I do with essential oils. You start with a goal, shape it into an intention, and select oils whose properties can support that intention. Then you hold that intention in mind while blending the oil, and revisit that expectation each time you use the oil. We know that scent is one of the most powerful memory triggers around, so by linking an aroma to a well-rehearsed intention, our expectations have the ability to affect the world. I don’t necessarily believe it is the chemical properties of an oil alone that makes it effective. 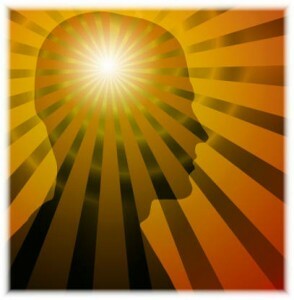 It is the interaction of the oils with the powers of the mind that creates the effect. But go ahead and call it magic if you like. Like the well-documented double-slit experiment, it certainly seems like magic. Here’s an oil blend that I recently created based on the principles outlined above. I wanted to blend an oil that would help my mind stay focused on prosperity and abundance, rather than on limitation and lack. I selected four oils that already have the properties desired, and then I “charged” them with my intention using an affirmation. I blended equal amounts of each oil into a carrier oil base of organic virgin olive oil that had been heated by the summer sun. 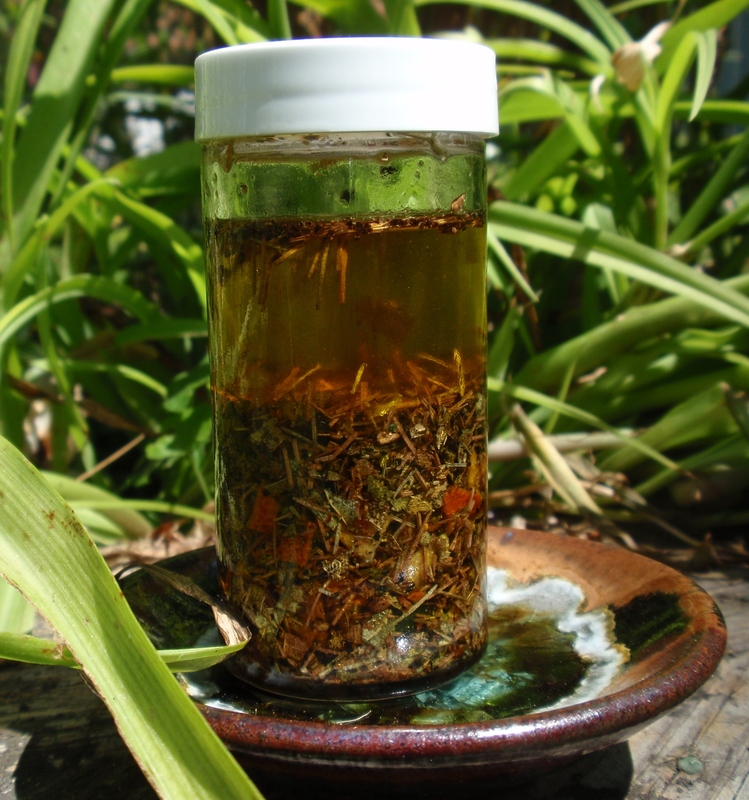 Additionally, as an experiment in oil blending, I also collected fresh whole ingredients, dried them in the sun, ground them up, and infused them into the oil. The result is delightful. I rub a little bit of the oil between my palms each day while saying the affirmation, “My life is filled with prosperity and abundance.” While I don’t believe the oil itself will help me win the lottery or anything quite as dramatic as that, I do believe that this oil is one more tool to help me refocus my thoughts on the positive outcomes I desire, rather than staying stuck in unproductive negative thinking. In the past few weeks, I have already seen the benefits of this practice. I am better able to recognize the blessings I have and the many ways abundance has manifested in my life. It is easier for me to see the ways in which I prosper, and to be grateful for all I have. It is a much happier and healthier frame of mind to be operating from, but I needed help to achieve it. This is the power and gift of intention. UPDATE: Less than two weeks after writing this post, and after continuing to use the oil and affirmations, I got a job offer for a fantastic position at a great organization I’ve been trying to get into for the past several years. I feel truly blessed by this process. And yet, I know from personal experience just how powerful and transformative affirmations can be. Our brains are a bit like computers, and our thoughts, shaped by language, does the programming. With a steady application of affirmations, you can reprogram negative thought patterns that are holding you back, and even manifest into your life things that will bring you greater joy. Affirmations are a powerful tool that are often underestimated. Affirmations can be used in the context of a wide variety of issues. Got love problems? Try affirmations. Battling depression? Try affirmations. Trying to find a job? Try affirmations. Want to lose weight? Be more peaceful? Want to lucid dream? Meet your spirit guides? Be less shy around people? All these kinds of things, and more, are suitable subjects for work through affirmations. The deck of affirmation cards I used are easy and fun to make, and very simple to use. I used a package of regular 3×5 index cards for my deck. (I later used unlined cards and a printer to make them even more colorful, but you can make these by hand as well.) Each card will contain an affirmation of a new reality you want to manifest in your life. Nothing is too big or too small to be worked on through affirmations. Emotions like anxiety, fear, depression, anger, loneliness, etc. are all excellent fodder for this tool. So are more tangible goals like career, family, finances, home, car, etc. And before you pooh-pooh the idea of affirmations like I did, give it a shot for a few weeks. This is a powerful tool that did really deep transformative work on areas that I had been stuck on for years. So, put one affirmation per card. Use colors and/or images if you like, but the words you choose are important. Each affirmation needs to be phrased in the positive. Our subconscious brains are very literal and latch onto action words, not the smaller parts of speech. For example, if you want to work on anxiety, don’t say “Don’t Panic” because the subconscious will focus on the word “panic” – that’s counter-productive. Instead, use a phrase like “Stay Calm” which gives the subconscious an action that it can work on. Focus on the present tense – the subconscious mind operates in the eternal now; instead of saying “the perfect job for me is coming” (which keeps this perfect job somewhere in the unreachable future) say “I am ready for my perfect job”. I’ve found that inspirational quotes can also make effective affirmation cards. Create as many or as few cards as you like. Once you have a “deck” of cards, you can also add more or take away cards that are no longer as relevant. Once you have your deck, simply flip through them and read them once a day. (Or more often if you like, but once daily worked for me.) You can do this at any time, any place. I often flip through my affirmation cards while waiting in line at the bank or the grocery store. That’s it. Just read your affirmations to yourself daily. It usually only takes 2-3 minutes. You don’t need to meditate on them (although focusing on your affirmations in a meditative state is another very powerful technique.) You don’t need to particularly “work on” these things. The daily read-through is the work. The brain is like a computer and will program itself with whatever instructions it receives. Your affirmation cards are the programming instructions. Input daily for best results. ¯ I am guided from within. ¯ I have the strength I need. ¯ With one deep breath – let it go. ¯ I love going to work. ¯ My heart is filled with love. ¯ There is always a reason. Each result serves me in a useful way. ¯ There is perfect abundance. ¯ I see the next step. ¯ My memory improves with each passing day. ¯ I am stronger than my temporary cravings. ¯ I can easily resist temptations. ¯ I am motivated to accomplish all that I have to do. ¯ At all times, I have unlimited access to my Inner Wisdom. *My favorite example of an affirmation that worked for me is the one that says “I love vegetables”. This was never true for me. As a kid, I avoided anything that resembled a vegetable with very few exceptions. Lettuce and corn were about it. As an adult, I learned to eat at least a limited few vegetables, but I still didn’t like them. I wanted to love vegetables, but… ick. So I put this issue into an affirmation card and worked on it. Every time this card came up, I chuckled with dubious amusement. After all, affirmations are good for some things, but this? Ha ha. But I kept the card in the deck. Month after month I laughed at my “vegetable affirmation.” It took about a year or so before I noticed that I had gradually begun adding more and more vegetables to my diet in ways that I hadn’t been conscious of. I’d go to a restaurant with a salad bar, and instead of lettuce and a few pieces of shredded carrots, I’d come back with my plate loaded with all sorts of things that just sort of “looked good” to me at the time. I gradually became aware that I was looking forward to such voyages into veggie-land. That was a long time ago, and now I can say without a hint of my former reservations that I really do love vegetables. A lifetime of revulsion was transformed into a much healthier attitude. Go figure. My silly “veggie affirmation” worked.